Our range of products include interactive fountain. 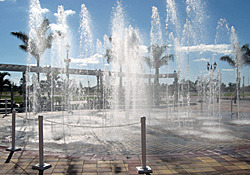 We specialize in providing an exotic collection of interactive fountains. These fountains are based on best available technologies and extensively acclaimed for high functional efficiency and creative effects. Demands of our interactive fountains are increasing day by day owing to mesmerizing patterns and exclusivity. These fountains are ideal to be used for themed parks, learning, leisure, garden projects, and interactive play areas and respite centres. Looking for Interactive Fountain ?